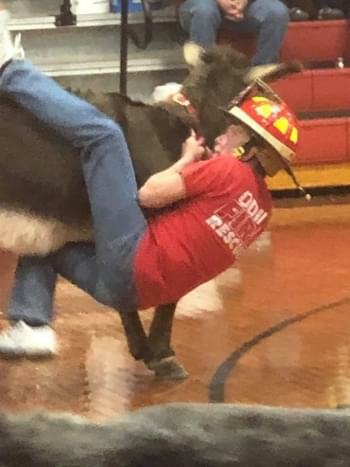 Odin Fire Captain Doug Davis refuses to let go of his donkey during Saturday’s donkey basketball game in Odin. Odin Fire Chief Greg Smith estimates a Saturday night donkey basketball game and spaghetti dinner raised about $3,000. Smith was pleased with an estimated 500 people who attended the game. About 100 attended the spaghetti dinner that preceded the Donkey Ball. Smith reports the money will go towards providing new turnout gear for members of the fire department. With the cost of providing gear to just one person costing around $3,000, the district will be looking at additional fundraisers in the future.